The word Alaska means “The Great Land,” and the state’s nickname is “The Last Frontier.” Both are appropriate monikers for a state containing huge swaths of wild country and uninhabited areas—a true hunter’s paradise, home to North America’s largest and most sought-after game animals. Covering 365,000,000 acres, an area one-fifth the size of the entire United States, Alaska has plenty of room for the adventurous hunter to roam. Alaska has more than a dozen species of big-game animals as well as excellent small game and waterfowl hunting opportunities. Big-game species include bison, caribou, elk, muskox, wolves, black bears, Dall sheep, moose, brown and grizzly bears, Sitka black-tailed deer, and mountain goats. Most hunting in Alaska occurs between August and October, but bears may be taken in either fall or spring in some locations. Alaska requires nonresidents hunting brown/grizzly bears, Dall sheep, or mountain goats to be accompanied by an Alaska-licensed guide or by an Alaska resident at least 19 years of age who is a close relative, defined as within the "second degree of kindred.” Nonresident aliens are required to have a guide to hunt any big-game animal in Alaska. All big-game guides in Alaska must be licensed by the state. For some hunts in Alaska, it is possible to hire a transporter instead of a guide. These are licensed individuals and companies who help hunters get to remote areas by bush plane, boat, horse, ATV, snow machine, etc. 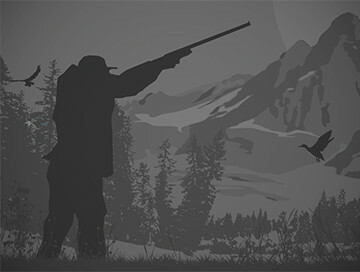 The Alaska Department of Fish & Game (adfg.alaska.gov) has an excellent website with in-depth information about hunting in the state. Check the site for specific license and tag requirements for each species. 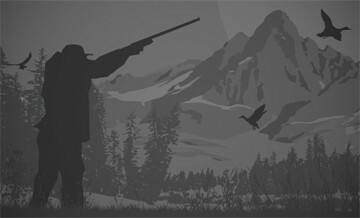 The Alaska Professional Hunters Association is another great source of information about Alaska: alaskaprohunter.org.